This how they create sleep deprivation with voice to skull technology and syntethic telepathy and can beaming and targetting your mind indoors and outdoors and tormenting you day and night. Time is now 05.30 and they looping and now neighbors started their harassment at same time – 05.00 in the morning. One neighbor start dropping things on the floor another started synchronizing open and close bathroom water crane and started flushing toilets. It’s same spirit within them. If State of Sweden don’t make their citizens barking like dogs sounding like sirens owls or cuckoo clock who controls them? And does same foeces even choice these method for State of Sweden. Both State of Sweden and neighbors shadowing and remote viewing and interfering with terrorizing. This shadowing and remote viewing is a reptilian race behavior or Nordics reptilians. They have spirit of stalking and harassing. When you take a bath rhey somehow beaming more of these kill you and today something that sound I will kill my self-suicide. Swedish healthcare also informs humans has a suicide gene and that humans have brain in the stomach. Then does people start using “I will kill you” when you passing them. It’s covertly fear mongering. They dont say it direct to you, they taegetting you covertly. Then they beaming commercial for K-Rauta and there is a phrase in this commercial they saying “ir could be good to talk to someone” and they beaming this outdoors when you exercise and then when you are home again. And when you washing your hair they start beaming hair shampoo commercial at same time you washing your hair. Then they beaming Mexico Mexico into your apartment and when you buy Cola to drink from the food store they start beaming Mexi-cola in to your apartment. When you watch tv programs they start beaming commercials from these programs and beaming sport commentators voices into your apartment, same method is used when you listen to music and beaming this. 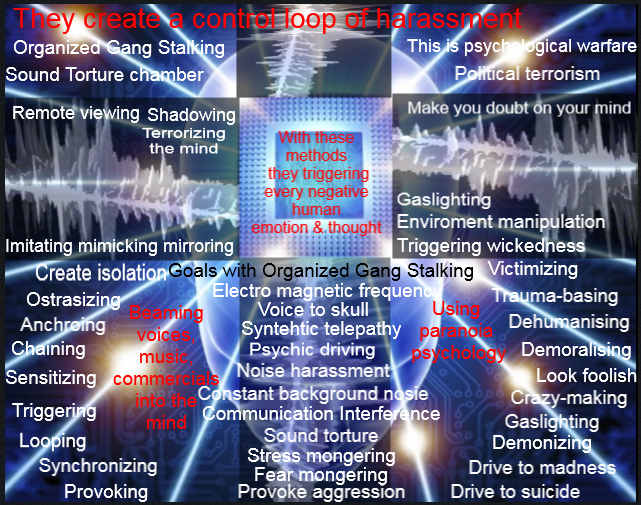 And the main goal with organized gang stalking is to drive the targeted individual to madness or to suocide and it seems State of Sweden beaming a lot of kill you message and keep you awaken with these constant looping and beaming.